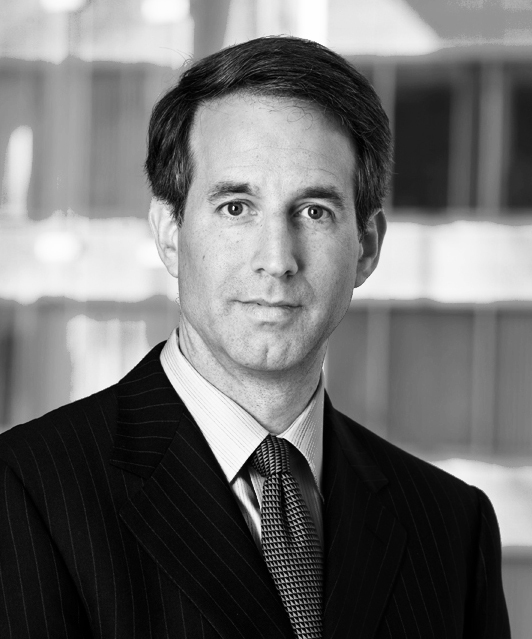 Matt Bennett is Senior Vice President for Public Affairs and a co-founder of Third Way. In that capacity, he has served as an adviser on gun policy to Sandy Hook Promise. He previously served in the White House as a Deputy Assistant to the President for Intergovernmental Affairs for President Clinton, where he served as the principal White House liaison to governors and covered a wide range of issues, including disaster response, Medicaid, immigration, education and others. Prior to that, Matt served in Vice President Al Gore's office. He was Communications Director of the Clark for President Campaign in 2004, and from 2001-2004 was Director of Public Affairs for Americans for Gun Safety. And on it went, as we sat around the table of a sterile conference room at a DC law firm, the confused and confusing mix of tenses signaling the freshness of loss, the impossibility of comprehending it yet. It was late January 2013, barely a month after the mass shooting at Sandy Hook Elementary School, and these were the families of some of the victims. Eleven of them had somehow summoned the strength to come to Washington to meet privately with Vice President Biden, members of Congress and cabinet members. But they weren’t here simply to accept high-level condolences. They had come to listen and to learn about mental health and school safety policy. And they were preparing to wade into some of the roughest waters in American politics: the gun debate. I was there to help them navigate those waters. The families’ DC-based advisor had invited my organization, Third Way—a group deeply involved with efforts to change the gun laws—to give them a sense of what they were in for. They were preparing to wade into some of the roughest waters in American politics: the gun debate. As Joe Manchin knew, however, it was never going to be that simple. Time and again, high-profile gun crimes—from assassinations to mass shootings—had seemed to galvanize public opinion. Yet time and again, this sense of urgency had faded, as the gun lobby slowed momentum in Congress to a crawl and then, often, to a halt. 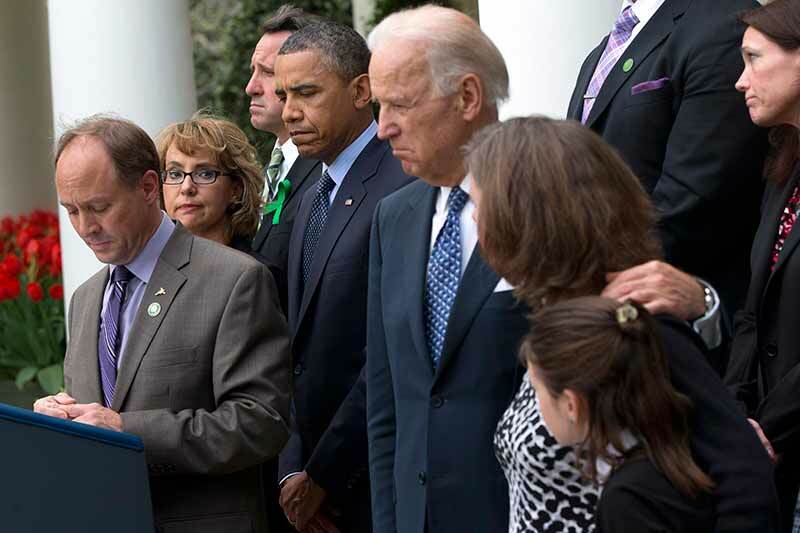 I stood before the Sandy Hook families on that day in January to brief them on the basics of gun policy and politics. These are smart, educated people. They assumed that, in the wake of this horror, Congress would pass some long-overdue gun safety measures. By then, however, this much was already clear to the political classes: there wasn’t going to be a renewed ban on assault weapons or high-capacity ammunition magazines, no matter how wrenching the scene in Newtown. Congress just didn’t have the courage to take such a step. The Senate wouldn’t pass it, and the House wouldn’t even consider it. Never before had the families of the victims of a gun massacre come together with such a focused commitment to bring about legislative and social change to Washington. The group I was meeting with, Sandy Hook Promise (SHP), had gotten its start in Newtown in the days after the murders. It began as a gathering in one family’s kitchen, with grief-stricken friends and neighbors of the victims vowing to support their community and to do something good for the country in the wake of such an overwhelming tragedy. Their “promise” was to listen and to learn, to promote dialogue, and to pursue “common sense solutions” in the areas of mental health, school safety and gun responsibility. Staffed by a sea of volunteers from Newtown and led by a few business professionals who took leave from their jobs to run it, SHP grew with astonishing speed into a sophisticated, effective organization. They enlisted a highly respected Washington consultant, Ricki Seidman, to guide them, and she quickly assembled a team of advisors. Within weeks of the funerals, the staff and volunteers from the community, along with many of the victim families themselves, were already working the corridors of power in Hartford. Eventually, they partnered with Governor Dannel Malloy on a strong new gun safety bill for Connecticut that flew through the legislature and was signed into law less than three months after the murders. At the same time, they began coming to Washington, where they were hoping to achieve a similar result in Congress. 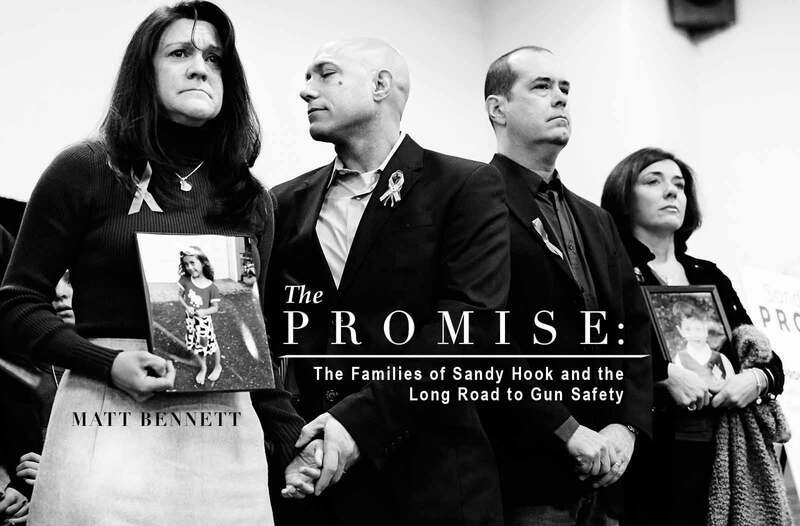 On April 17, 2013, Sandy Hook Promise families got a bitter taste of Senate procedure and gun politics after the defeat of a bipartisan compromise to require criminal background checks for all commercial gun purchases. Mark Barden, left, who lost his son Daniel in Newtown said: "We return home for now, disappointed but not defeated. We return home with a determination that change will happen, maybe not today but soon." 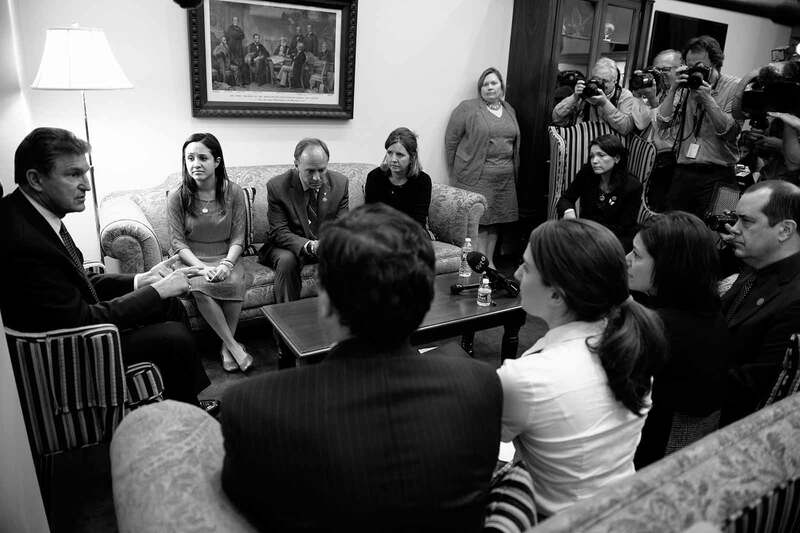 L-R: Mark Barden; former Rep. Gabby Giffords; Neil Heslin, father of Jesse Lewis; President Barak Obama; Vice President Joe Biden; Jackie Barden, with daughter Natalie; and Nicole Hockley, mother of Dylan. Tim Makris, the father of a Sandy Hook Elementary fourth-grader who was not hurt in the shootings, is a co-founder of SHP and runs it day-to-day. He and the other leaders of SHP were building the ship as it sailed, putting together an office, staffing it with volunteers, raising money, hiring consultants, tending to the many needs of the Sandy Hook community, and providing a support group for families of the victims as well as for those they call the “survivors”—the 12 kids who made it out alive from the two classrooms that were under attack. Sandy Hook parent Timothy Makris - who left a successful career to head up the fledgling Sandy Hook Promise - says the Senate vote was a temporary setback that only strengthened the resolve of SHP supporters to find consensus on common ground and common sense solutions to gun safety. At the same time, Makris and the others, including some of the victim families themselves, were getting a crash-course on Senate procedure, gun policy and, most of all, gun politics. They were beginning to appreciate the degree of moral authority they would wield in this debate—and also the severe limits on this unwanted new power. On March 30, 1981, John Hinckley tried to assassinate President Ronald Reagan. White House Press Secretary James Brady, face down at right, and Washington police officer Thomas Delahanty, front, were both wounded. 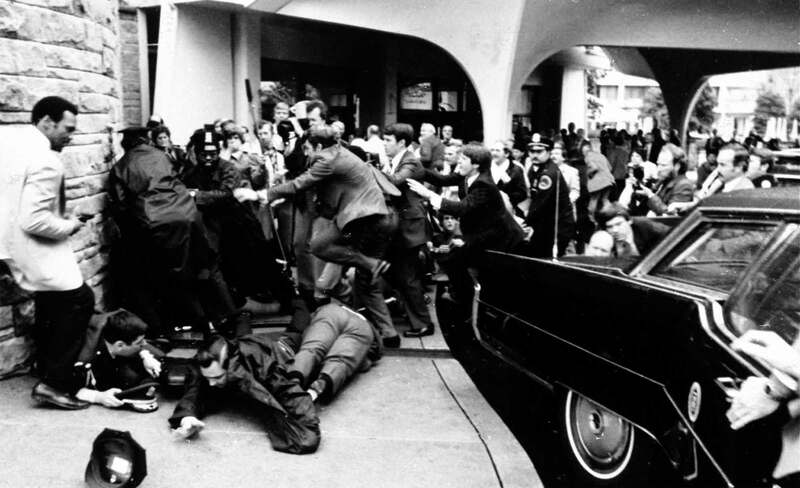 Reagan himself was hit by a bullet that ricocheted off the presidential limousine. Before the late 1960s, America had almost no federal or state gun laws. Buying a gun in most states was similar to buying a hammer—one went to a store, picked out a model, paid and left, gun in hand. The 1968 Act contained a rather large practical flaw: adherence to it was based on the honor system. After the assassinations of Robert Kennedy and Martin Luther King, Jr., Congress passed the Gun Control Act of 1968. That law established classes of people banned from buying or possessing firearms: felons, undocumented immigrants, those dishonorably discharged from the military (a category included because of Lee Harvey Oswald) and others, including the mentally ill. The mental health prohibitions were narrow, applying only to those who had been found mentally ill by a court and those involuntarily committed to a mental institution. In later years, domestic abusers were added to the list. The Act also created a federal license for the sale of firearms and a set of rules that applied only to those “in the business” of selling guns. These Federal Firearms Licensees (FFLs) were, for example, barred from selling handguns to anyone under age 21. Tragic or shocking national events have inspired much of the federal legislative action on gun issues. 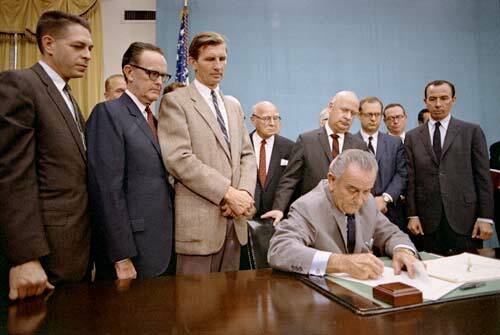 On October 22, 1968, President Lyndon B. Johnson signed the Gun Control Act of 1968 into law. The assassinations of President John F. Kennedy, Senator Robert Kennedy, Malcolm X, and Martin Luther King, Jr. in the five preceding years helped spur the law to passage. And that was it for federal gun laws over the next 25 years. Some tried to do more. John Hinckley’s attack on President Reagan in 1981 gravely wounded White House Press Secretary James Brady. Afterward, he and his wife Sarah became important advocates for new gun safety provisions. 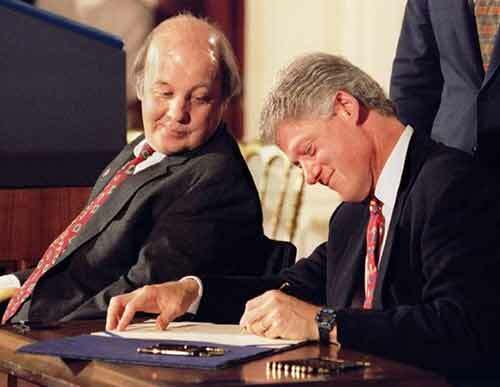 President Bill Clinton (Right) signs into law the Brady bill as former White House press secretary James Brady, the bill's namesake, looks on November 30, 1993 at the White House. It wasn’t until President Clinton came into office promising to address the crack cocaine-fueled crime epidemic, however, that the Brady Bill got traction. Clinton signed it into law in 1993, a dozen years after the Hinckley attack. For criminals and other prohibited buyers, obtaining a gun finally became a bit more complicated than buying a six-pack (but only, as we’ll see, if one was buying it from an FFL). On the heels of the Brady Bill success, then-Senator Joe Biden (D-Del.) and then-Representative Chuck Schumer (D-N.Y.) muscled the Assault Weapons Ban across the finish line in 1994. Today, nearly 20 years later, those are the last significant federal gun safety bills to have become law. In 33 states, private sellers at gun shows are not required to run background checks on buyers. This in effect creates mega-malls where buyers can connect with sellers who aren't picky about their customers. 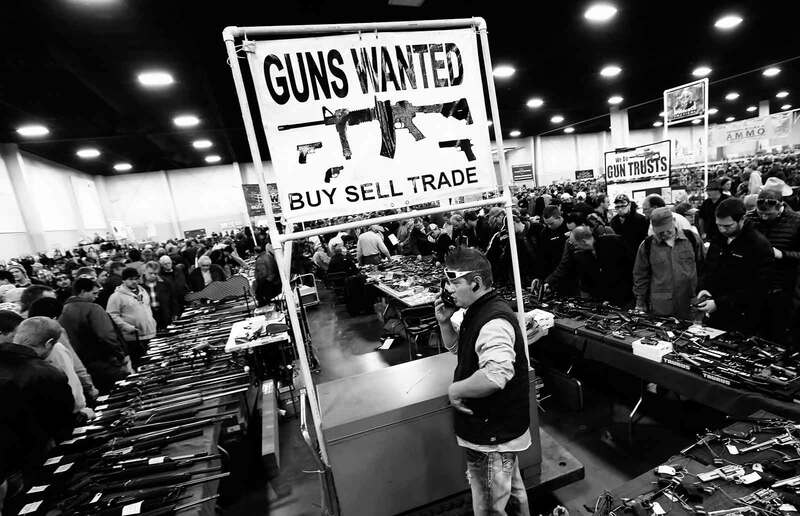 Attendees look at guns at the Rocky Mountain Gun Show in Sandy, Utah, U.S., on Saturday, Jan. 5, 2013. A working group led by Vice President Joe Biden is seriously considering measures that would require universal background checks for firearm buyers, track the movement and sale of weapons through a national database, strengthen mental health checks and stiffen penalties for carrying guns near schools or giving them to minors. The two gun bills that Clinton signed those first years of his presidency were indeed significant. In order to make it through Congress, however, both were engineered with serious flaws built into them. Since [NICS's] inception in 1998, nearly two million gun sales to potential buyers in the prohibited classes have been stopped by instant checks. In addition to performing reliably and quickly, NICS is achieving much—though not all—of its purpose. Since its inception in 1998, nearly two million gun sales to potential buyers in the prohibited classes have been stopped by instant checks. But 15 years into its effort to compile the necessary information, the data in the Instant Check System vary from excellent to terrible, with the result that not every prohibited class of buyers is equally well monitored. NICS does a great job tracking felons, most of whom are in the system and effectively stopped from making gun purchases when the checks are run. The information on domestic abusers, provided mainly by the states, is good, though there remain some problems within that category that the states are working to address. 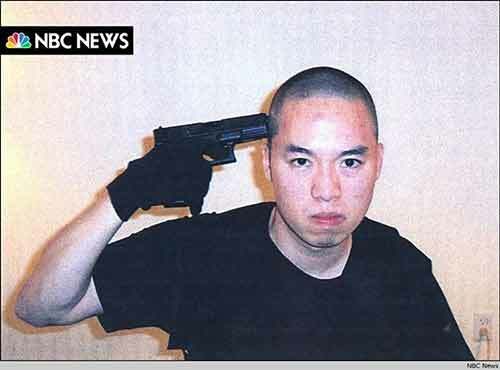 NBC News says Seung-Hui Cho sent this self-portrait to them as he paused between shootings in his rampage at Virginia Tech in 2007. Cho killed 32 people and wounded 17 others. Cho was able to purchase his guns through licensed dealers because he did not reveal that a Virginia court had ordered him to undergo outpatient treatment at a mental health facility. The massacre of 32 people at Virginia Tech might well have been avoided if Seung-Hui Cho had been in the database, as he should have been. A major and continuing source of trouble for NICS is the mental health category. For every 10,000 background checks run, only five would-be buyers are denied on grounds of mental health. This country just isn’t that sane. Poor communications and unfounded concerns about patient privacy have meant that too few of the necessary mental health records have made it into the database—sometimes with tragic results. The massacre of 32 people at Virginia Tech might well have been avoided if Seung-Hui Cho had been in the database, as he should have been. Still, the data problem is being addressed, if slowly. Congress has provided incentives, and states are getting their acts together. Some states are now sending hundreds of thousands of previously unavailable mental health records to the database; others continue to lag far behind. Oklahoma, for example, has just three names in the mental health category of the database. The much bigger problem has nothing to do with the database, however, but with the intrinsic design of the Brady Act—the loopholes in the law that allow criminals to get guns. While the 1968 Act applies to everyone, the Brady Act does not. Only those buying their guns from a licensed dealer must submit to a background check. Now, there are a lot of licensed dealers out there—59,000 at last count, which is almost five times the number of McDonalds franchises in America. But many buyers get their guns from unlicensed sellers, mostly at gun shows or through ads on the Internet. No one knows how many unlicensed sellers there are; their ranks vary from a guy selling off his dad’s hunting rifle to the illegal gun trafficker moving hundreds of weapons per month through online sales. These are basically mega-malls for criminals, who can generally find all the guns they want from sellers who aren't picky about their customers. Hard as they are to count, most of them are easy to find. For example, anyone who attends a gun show in one of the 33 states that haven’t fixed this loophole by requiring that background checks be performed by all sellers at such shows will have no trouble spotting the tables with signs that say “no questions asked.” The licensed dealers at these shows—and there are about a hundred such events every weekend, many of them involving thousands of vendors—are running background checks on their buyers; the so-called “private sellers” at the next table over are not. So if you were a felon or a domestic abuser, where would you go to buy your gun? These are basically mega-malls for criminals, who can generally find all the guns they want from sellers who aren’t picky about their customers. Adam Gadahn, an American member of Al-Qaeda, Jan 6 2008.Gadahn actually released a video message noting how easy it is to buy guns in the U.S. and urging fellow radicals to take advantage. "You can go down to a gun show at the local convention center and come away with a fully automatic assault rifle, without a background check, and most likely without having to show an identification card. So what are you waiting for?" Then there is the Internet, with sites like armslist.com. The New York Times recently took a look at that site and found about 170,000 guns for sale during their three-month investigation. Ninety-four percent of the ads were posted by private sellers, meaning that it’s easy pickings for prohibited buyers who do their shopping online. The Times didn’t have to look far to find felons and domestic abusers both buying and selling guns. As long as they are buying from someone in the same state, there is no need to involve a dealer and no background check is required. The 1994 Assault Weapons Ban expired in 2004. Here, Tom Mannewitz, who runs the Target Masters Shooting Range in Garland, Texas, displays several United States-made assault-style rifles. After the Sandy Hook shootings Mannewitz was quoted as saying, "Instances like this create a knee jerk reaction. They've got to look at something to vilify. And it's easier to vilify a gun, than a system that has holes in it, that needs to be fixed." The Assault Weapons Ban, which most supporters assumed—wrongly— would be renewed after its 2004 expiration date, has been off the books for almost a decade. Most modern firearms sold in the U. S. are semi-automatic, meaning that they fire one round with each trigger-pull and automatically eject the spent cartridge; they can be fired again on the next trigger-pull without being cocked. (Fully automatic “machine guns,” which keep firing with a single pull of the trigger, are largely banned from civilian possession.) Semi-automatics use removable magazines or “clips,” and they can be handguns or rifles. While most guns are now semi-automatic, they vary tremendously in size, shape, range, speed and accuracy. Some firearms with enormous power are built to act and look like weapons of war, and in the 1980s they earned the moniker “assault weapons.” (The gun lobby rejects that name, preferring “modern sporting rifles”). Many of these very lethal weapons began falling into the wrong hands. The Assault Weapons Ban of 1994 was born of a complaint voiced by law enforcement that they were being outgunned in the crack wars. The police, often armed with pistols of an earlier era, were battling street gangs wielding assault weapons like TEC-9s and AK-47s. Reacting to the Sandy Hook shootings and other recent mass shootings,Sen. Dianne Feinstein, D-CA, introduced the Assault Weapons Ban of 2013, saying: "Mass shootings in Newtown, Aurora, and Tucson have demonstrated all too clearly the need to regulate military-style assault weapons and high capacity ammunition magazines. These weapons allow a gunman to fire a large number of rounds quickly and without having to reload." 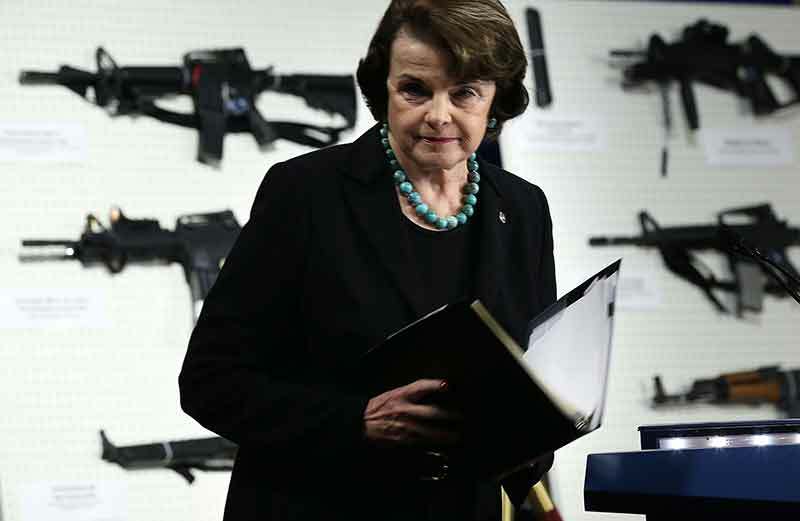 Feinstein is a veteran of the 1994 battles over assault weapons legislation. The NRA-led opposition launched a fierce battle against the ban. In the end, a deal was cut to salvage it, albeit in a form that drained it of much of its effectiveness. The sponsors had to make three main concessions to get the ban through Congress. First, it would expire in 10 years. Second, it would not be retroactive, meaning assault weapons produced before the date of enactment would remain legal. There were hundreds of thousands or perhaps even millions of those (no one knows how many), so the ban left a lot of assault weapons on the street. Finally, the ban was limited to a list of 18 specific models of firearms (e.g., Uzis and MAC-10s), along with any guns that contained two or more of a list of military-style attributes. Since there is not a huge market demand for many of these features—among them bayonet mounts and grenade launchers—this constituted little hardship for either buyers or manufacturers. As a result of these concessions, the Assault Weapons Ban, which most supporters assumed—wrongly—would be renewed after its 2004 expiration date, has been off the books for almost a decade. And its record of success during the ten years it did remain in effect is mixed. Some academics and other criminologists argue that if it had remained in place, the benefits would have begun to be realized by now. However, the ease with which gun makers were able to sidestep the ban even before it expired suggests that its effect on gun violence would have been minimal. 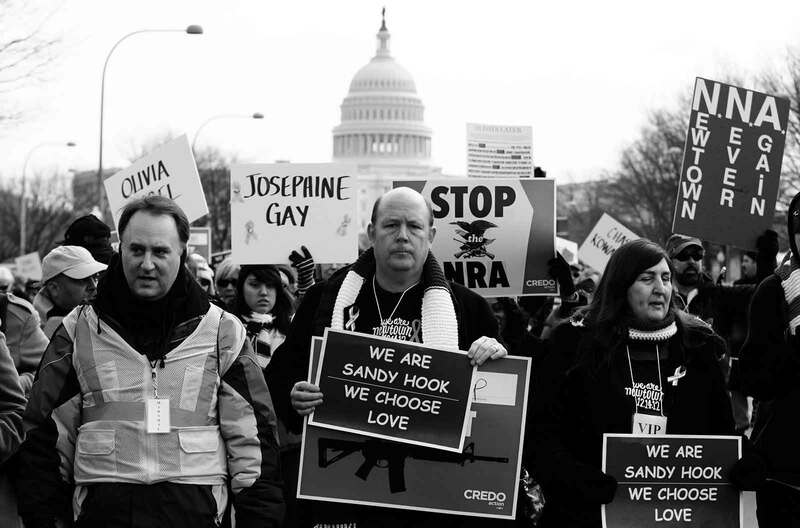 Friends of Chase Kowalski, one of the victims of the shooting in Newtown, Connecticut, take part in the March on Washington for Gun Control on January 26, 2013 in Washington. Would Tougher Laws Have Prevented Sandy Hook? They were committing themselves to the passage of gun safety laws that had no actual bearing on the crime that had torn apart their own lives. Recognizing the treacherous politics and questionable impact of the Assault Weapons Ban, the Sandy Hook Promise group had initially wanted to put their efforts into a bill that would limit the permissible size of magazines. This made sense to them, because when they first entered the gun debate, their focus was on the specifics of the crime that had taken the lives of their loved ones. Adam Lanza was armed with two pistols, but his main weapon that day was a Bushmaster .223 caliber AR-15 assault rifle, which he loaded—and reloaded—with ten 30-round high-capacity magazines and twenty 20-round magazines; his 700 rounds were enough to kill everyone in the school. He fired 154 rounds in about four minutes. It was in the brief intervals when he was changing magazines that several children managed to escape. Had Lanza been forced to reload 16 times rather than six (as he would have with standard 10-round magazines), the Sandy Hook parents believe that many of their children would be alive today. 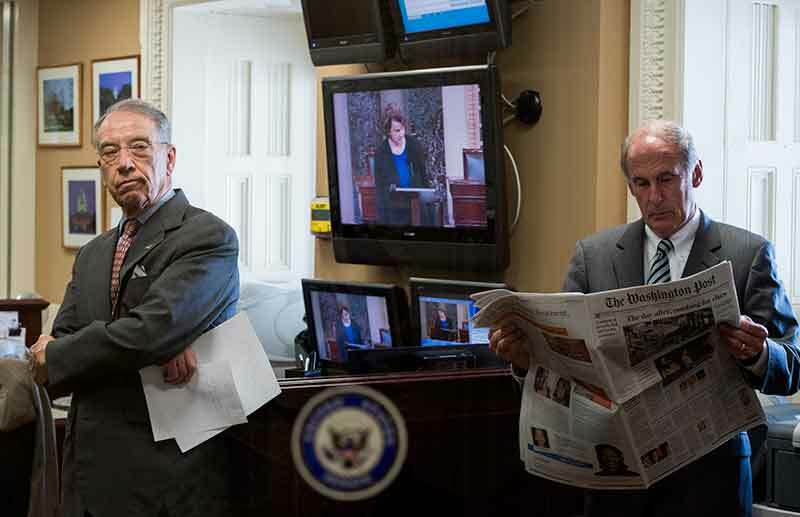 Sen. Chuck Grassley, R-IA, left, and Sen. Dan Coats, R-IN, wait in the Senate Radio/TV Gallery for arriving senators for a news conference on alternative gun legislation on Wednesday, April 17, 2013. Sen. Dianne Feinstein, D-CA, is seen on the television monitors speaking on the Senate floor about gun control legislation. As I discovered, it is an awesome and terrible thing to look into the eyes of the mother of a recently murdered six-year-old who believes, perhaps correctly, that her child would be alive today if our laws had been sensible enough to have limited the number of rounds in a magazine. And it is almost as tough to have to tell such parents that Congress wasn't about to take that step even now. But after I did so, to their great credit they summoned the courage to ask what kind of gun legislation would be possible and what role they could play to help get it passed. In asking these questions, the families of Sandy Hook Promise began their transformation from deeply sympathetic victim-advocates into a force to be reckoned with in the modern gun debate. While continuing to pursue a long-range goal of limiting magazine size, they decided to focus in the near-term on legislation that could have an immediate impact on gun violence: closing the gun show and Internet loopholes by requiring that all such sales go through FFLs, who can and must run background checks. Perhaps what is most remarkable about their decision is that they were committing themselves to the passage of gun safety laws that had no actual bearing on the crime that had torn apart their own lives. The guns Adam Lanza used in his assault had been stolen from his mother, his first victim, and Nancy Lanza had been in lawful possession of those firearms—she passed background checks for their purchase and registered them (as is required in Connecticut). The families knew that legislation regulating the sales of weapons at gun shows or over the Internet would have done nothing to save their children. Politicians acting like parents, background checks, high-capacity magazines, national sentiment, terrorists, gun shows, the NRA, and what’s different after Sandy Hook. A model for this kind of public-spirited thinking is the work of the 9/11 Family Steering Committee. In the years after their own tragedy, that group pursued a suite of legislative measures that included everything from creating the Department of Homeland Security to changing how intelligence is gathered and shared. Almost none of these ideas, had they been in place on September 11, would have played a role in stopping Mohammed Atta or the others. But they believed they were making the country safer for everyone, and that was enough. The same was true for the families of Sandy Hook Promise. 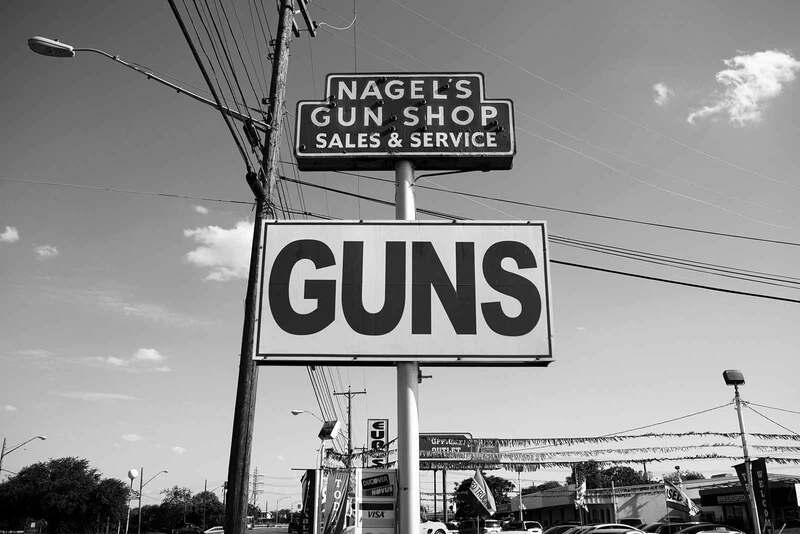 Nagel's Gun Shop opened in 1942 and calls itself one of the largest family-owned gun stores in Texas. In the days after the Sandy Hook shooting Nagel salespeople reported an unprecedented run on sales . Nagel's Gun Shop opened in 1942 and calls itself one of the largest family-owned gun stores in Texas. In the days after the Sandy Hook shooting Nagel salespeople reported an unprecedented run on sales. The question of how to make the country safer from the carnage of gun violence is vital, because the assassinations and mass murders that galvanize our attention every so often actually account for only a small percentage of gun-related deaths. Beyond the headlines there is a steady daily tally of violence that is mainly ignored in the press. The total number of gun deaths per year is about 31,000. This includes roughly 11,400 murders, 19,000 suicides and 600 accidental shootings—more than 10 firearms deaths per 100,000 people every year. By contrast, Japan, which has strict gun control laws, has 0.07 per 100,000, and Switzerland, where most citizens have guns in the home, has 3.84. In addition to deaths, the U.S. has about 80,000 firearms-related injuries annually and 500,000 crimes involving a firearm every year—about one per minute. 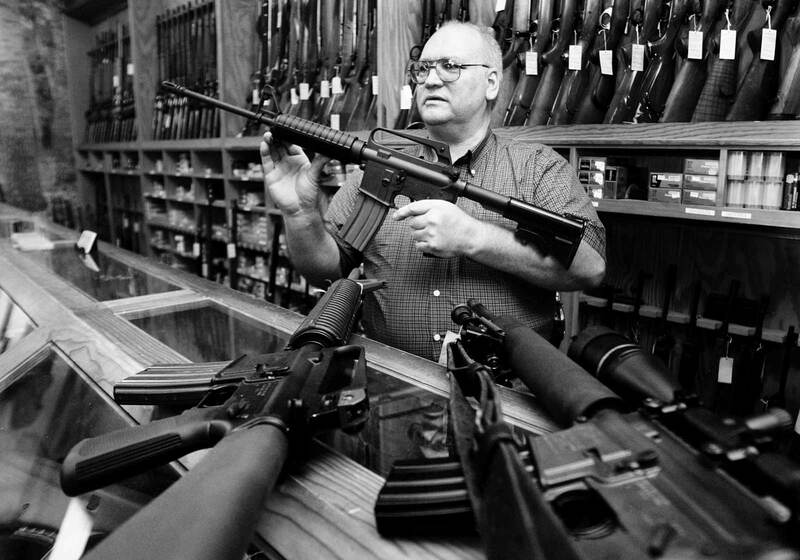 Americans have stockpiled almost half of the privately owned firearms in the world. Because there is no national database of guns or gun owners, no one knows how many guns are in private hands in the U. S. According to polling, the rate of gun ownership (the percentage of households containing one or more firearms) has actually been falling over the last two decades, but the total number of guns in private possession has gone up sharply, from 200 million in 1994 to somewhere between 270 and 300 million today. When we compare ourselves to other countries (using the latest data, from the 2007 Small Arms Survey), we find that the U.S. has by far the highest rate of private gun ownership in the world: 88 guns per 100 people. (Next on the list is Yemen, at 55 guns per 100.) At the conservative estimate of 270 million guns, Americans have stockpiled almost half of the privately owned firearms in the world. The overwhelming majority of those guns are in the possession of responsible, law-abiding adults. But that leaves plenty that are not. The question confronting lawmakers is how to stop a legal product from getting into the hands of those who would use it for illegal purposes. The answer begins with understanding where criminals get their guns, and we actually know a lot about that. First, in 90 percent of gun crimes, the firearm has changed hands at least once since the original sale, meaning that someone other than the first dealer provided the gun to the criminal. Second, about one-third of the guns involved in crime have crossed state lines, despite the federal prohibition against moving guns interstate. Third, the most common age of those who commit crimes with guns is 19, followed by 20, followed by 18, despite the fact that licensed dealers are not permitted to sell handguns to anyone under 21 (and virtually all gun crimes are committed with handguns). Taken together, these data suggest that crime guns tend to come from an interstate network of gun traffickers that moves guns out of the legal market and into the hands of criminals and minors. The traffickers who provide these crime guns get them from dealers (often through the use of “straw” purchasers who go through the background check for others), from theft, or from unregulated “private sales” at gun shows or through the Internet. 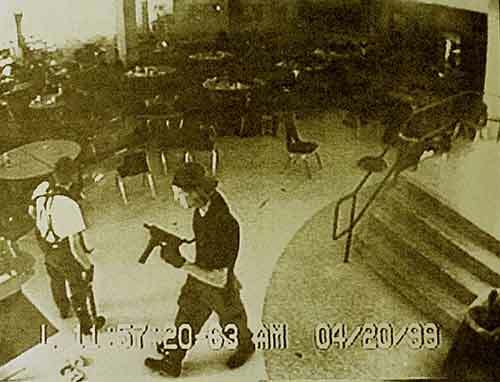 This still image from a school security camera shows Eric Harris, left, and Dylan Klebold, carrying a TEC-9 semi-automatic pistol, stalking the cafeteria at Columbine High School, in Littleton, Colorado. The April 20, 1999 rampage left 12 students and one teacher dead. Both gunmen killed themselves. One of their guns came from an unlicensed dealer at a gun show. ...after the [Columbine] attack she testified that she would not have gone through with the transaction had she been asked to submit to a background check. The patterns and sources of crime gun trafficking have been well known for a long time. Then-Representative Schumer was issuing reports about the so-called “iron highway” of black-market firearms as far back as 1996. But his was a lonely voice, and few put any effort into erecting roadblocks to stem the flow of this traffic. The massacre at Columbine High School in 1999 changed that by spotlighting a main on-ramp to this highway: gun shows. One of the guns used by those underage killers was obtained for them by a girlfriend who was unaware of their plan. She bought it from an unlicensed seller at a gun show, and after the attack she testified that she would not have gone through with the transaction had she been asked to submit to a background check. After Columbine, the billionaire CEO of Monster.com, Andrew McKelvey, decided to get involved in the gun debate. McKelvey had never been political and had no personal connection to gun violence. But the tragedy spurred him to action. Dissatisfied with the existing gun control groups, he founded Americans for Gun Safety (AGS), which focused on closing the gun show loophole. (This was before the days of online gun sales and sites like armslist.com, so the gun show loophole was the only one that mattered.) I went to work for AGS in 2001, and in 2005, we folded AGS into a broader think tank, Third Way, the organization I work for now. At AGS, we recruited Senators John McCain (R-Ariz.) and Joe Lieberman (D-Conn.) to co-sponsor a federal bill requiring that all vendors at gun shows run background checks on their buyers, and we pushed hard. After 9/11, in order to show how easily terrorists could exploit the Brady Act loopholes, we highlighted Hezbollah Agent Ali Boumelhem’s purchase of assault weapons at a gun show. However, gun safety advocacy was a tough job in the early years of George W. Bush's presidency. Conservative Republicans controlled the White House, Senate and House, and they were none too friendly to such initiatives. Even so, AGS had a few successes at the federal level, including legislation to improve the quality of the data provided to the National Instant Check System, and a temporary win in the Senate on gun shows which caught the NRA by surprise. But in the years after Columbine, despite cascading gun crime rates and some extraordinary and high-profile massacres, Congress simply refused to move. It took Adam Lanza’s act of madness to force the issue again. Hundreds of gun owners and enthusiasts attend a rally for gun appreciation day at the State Capitol in Hartford, Connecticut, on January 19, 2013 - just five weeks after the Sandy Hook Shootings. Hundreds of gun owners and enthusiasts attend a rally for gun appreciation day at the State Capitol in Hartford, Connecticut, on January 19, 2013. Many people wore green ribbons in solidarity with citizens of Newtown where 20 children and six adults were killed by a gunman Dec. 14. Because of what they have gone through, you would assume that the Sandy Hook families would be greeted with universal demonstrations of respect, kindness and sympathy, even by those who disagree with the legislative goals they are pursuing. But you would be wrong. When two of the families went to Hartford for a state legislative hearing in late January, some gun rights proponents made national news by heckling Neil Heslin, whose son Jesse was killed in the massacre. Dozens of activists in the crowd shouted “Second Amendment!” as Heslin testified. The outbursts in the Connecticut capitol drew widespread opprobrium. Yet this was hardly the worst of what the families have suffered at the hands of some gun-rights supporters. Indeed, a full-fledged conspiracy theory was hatched in the fevered fantasies of some Second Amendment absolutists. They accused the families of creating a “hoax,” of faking the deaths of their children and adult loved ones. Facebook pages and YouTube channels were launched to “prove” this proposition. And some of the families received calls, emails and letters insisting that they were actors and liars, playing their part in an Obama-led scheme to abrogate gun rights. Though a distinct minority, this group has come to control the terms of the gun debate, exercising a power that vastly exceeds their numbers. This harassment of families in the midst of their deepest grief added a new level of barbarity to the debate over guns in America. And it made clear that for some, guns are a flashpoint in our politics that burns as hot as anything we have seen since the civil rights movement. It is not clear where all of this passion comes from, because the headwaters of the American gun culture have never been discovered. It could be our frontier spirit; it could be our libertarian ethos; it could be the Second Amendment itself. Whatever the source, Americans in much of the country have developed the belief that gun ownership is somewhere on the continuum between being a legal privilege and a nearly sacred right. Approximately 100 million adults live in a home with a gun. (The term “gun owner” can be slippery when it comes to family-owned firearms.) They break down roughly into three groups: those who own guns mainly for sport, those who own guns for protection, and those who own guns as a bulwark against government tyranny. Numerous polls show that the overwhelming majority of people in the first two groups (sport shooters and home protectors) is comfortable with the kinds of common-sense restrictions on gun ownership advocated by the Sandy Hook parents. The third group, however, is made up of what we could call the “constitutionalists.” Though a distinct minority, this group has come to control the terms of the gun debate, exercising a power that vastly exceeds their numbers. Their principle mechanism for wielding this power is, of course, the NRA. The National Rifle Association is nearly 150 years old and claims a membership of 4.5 million. For most of its history, the NRA was a stolid, safety-oriented group: think AAA. They handed out safe shooter patches to summer campers and worked on land conservation. At the annual NRA convention in 1977, however, the “Cincinnati Revolution” upended those traditions. 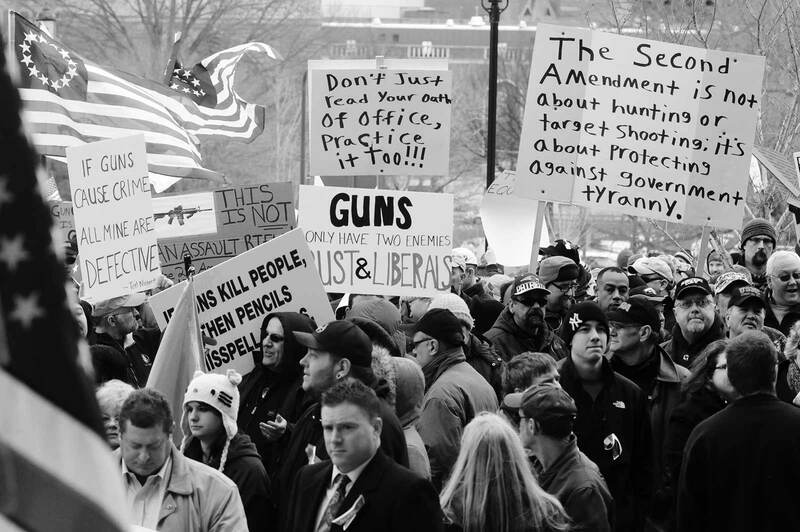 Constitutionalists ousted the old leadership and installed a new, hard-line regime focused on the absolute protection of gun rights and broader conservative political activism. 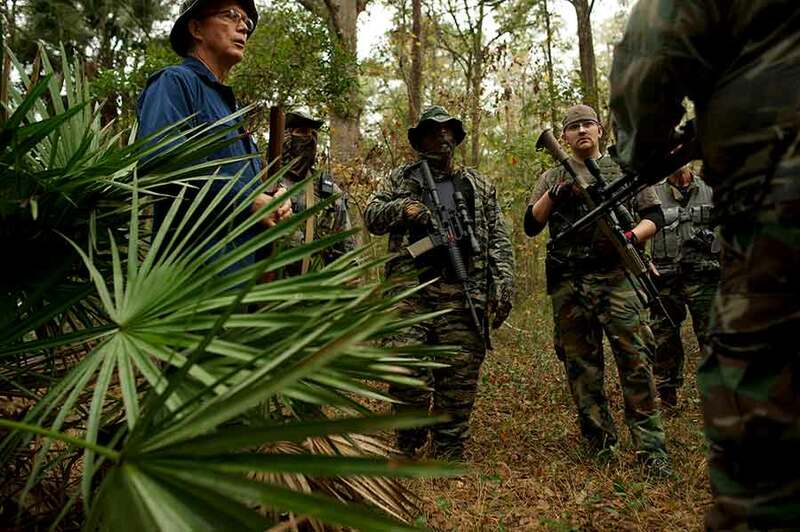 Members of the North Florida Survival Group listen as their leader critiques their performance during an enemy contact drill training exercise in Old Town, Florida, December 8, 2012. The group trains children and adults alike to handle weapons and survive in the wild. The group passionately supports the right of U.S. citizens to bear arms and its website states that it aims to teach "patriots to survive in order to protect and defend our Constitution against all enemy threats." Who these constitutionalists are and how many they number we don’t know with any certainty. Some are anti-government conspiracy theorists who believe that the “black helicopters” are coming to take their guns. In the 1990s, the most radical of these formed so-called “militias” that refused to pay taxes or honor gun laws. They were the catalyst for the sieges and shootings at Ruby Ridge and Waco, and they spawned Timothy McVeigh, the main bomber of the Oklahoma City Federal Building in 1995. While most constitutionalists do not advocate violence, they are resolute about gun rights and gun ownership. They believe that gun laws actually make communities less safe by disarming the good guys. Post-Newtown, this was reflected in the NRA’s central proposal, which was to put armed guards in schools and to give teachers gun training. And they reject any gun safety measure, no matter how small, as a Second Amendment violation. When they join the NRA, the constitutionalists subscribe not to American Rifleman, the NRA’s magazine for mainstream sport-shooters; they get America’s 1st Freedom, the NRA’s hardline journal for their most committed core. Wayne LaPierre, Executive Vice President of the National Rifle Association, speaks during the National Rifle Association's 139th annual meeting in Charlotte, North Carolina May 15, 2010. 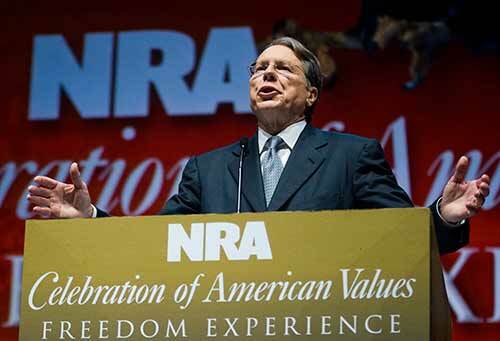 The NRA under LaPierre has never deviated from its goals, never softened its tone, no matter what the context. Only seven months after 9/11, LaPierre gave a speech at the NRA convention where he attacked Americans for Gun Safety for trying to “hijack your freedom and take a box-cutter to the Constitution.” “That’s political terrorism,” he thundered, “and it’s a far-greater threat to your freedom than any foreign force." Similar bullying—of friends who don’t toe the line—occurs even within the gun industry. When the iconic firearms manufacturer Smith & Wesson agreed to a deal with the Clinton administration on the issue of trigger locks, the NRA called for a boycott. Smith & Wesson sales dropped 40 percent, after which the company went private, fired its management and abrogated its agreement with the White House. The gun industry’s trade association, the National Shooting Sports Foundation, has followed the NRA’s lead on all things political. As a result, the NSSF has refused to endorse the Senate gun safety bill. That might not be surprising if it weren’t for one fact: the NSSF headquarters is in Newtown, Connecticut—less than three miles from Sandy Hook Elementary School. 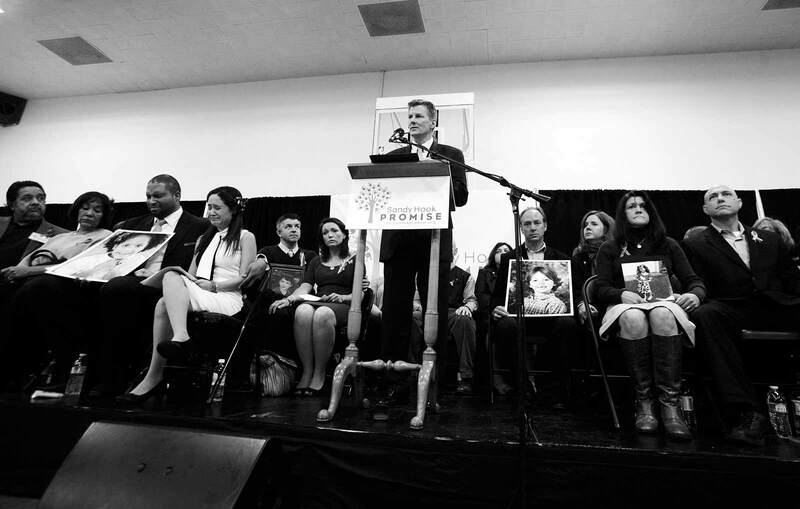 Tom Bittman, a Sandy Hook Promise co-founder, speaks at the January 2013 launch of the organization. In the three months that followed, the group managed to work to create a strong new gun safety law for Connecticut and inspire a bi-partisan gun safety bill in the U.S. Senate. 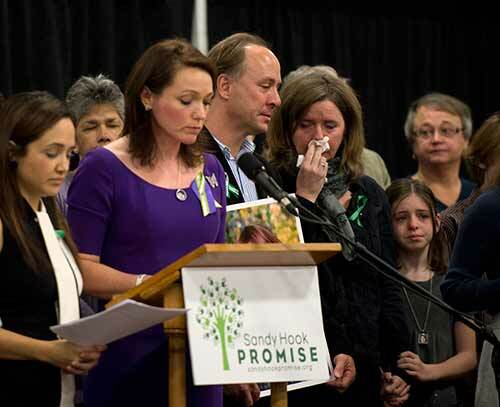 Though the Senate bill was defeated, Sandy Hook Promise has established itself as a force to be reckoned with that's in it for the long haul. In the months between the Sandy Hook shootings and the April gun bill debate in the Senate, Joe Biden and Chuck Schumer were back in the saddle again, working to cut a deal that could survive an NRA onslaught. From the White House, the vice president was corralling the gun safety groups, coaxing the lawmakers and cajoling the public. In the Senate, Schumer was running the inside game, trying to find an NRA-approved Republican to make a match with his NRA-friendly Democrat, Joe Manchin. In a twist, Sandy Hook parents Francine and David Wheeler stood in for President Barack Obama on the April 13, 2013 Your Weekly Address from the White House. Fighting through tears, Francine shared stories of their son Ben, and asked American voters to urge their senator to vote for a bill to close the gun show and Internet loopholes. It wasn't enough. On the eve of the Senate debate, they succeeded. Pat Toomey, a conservative Pennsylvania Republican, agreed to co-sponsor legislation with Manchin that would close the gun show and Internet loopholes. The announcement of the Manchin-Toomey amendment helped overcome a filibuster, with 16 Republicans joining most Democrats in voting to proceed to the debate. That week, Tim Makris and a sizable group of SHP families were in town to lobby. The level of their newfound sophistication about Washington and gun policy was impressive. After they were briefed on the contents of Manchin-Toomey, they immediately began pressing target Senators to support the bill. They were told time and again that the bill would never have progressed this far without them and that they had much to be proud of. For the first time in the modern history of the debate, a gun safety vote has had a negative impact on the approval rating of Senators voting "no"... and a positive impact on red-state senators voting "yes"
It’s often the case that some of the most effective advocates in American politics are people who have a personal stake in an issue. Those seeking funding for serious diseases, including nearly every variety of cancer, have perfected the art of cause-based lobbying. They bring people who are suffering from the illness, photos of family members lost to it, testimonials to the pain and misery endured by their loved ones, and PowerPoints replete with statistics and data. They are routinely granted audiences with congressional staff members to make their case. Reacting to the Sandy Hook shootings, Connecticut passed the most comprehensive gun control measures in U.S. history. Brookings expert, John Hudak predicts how these laws will inform social science and the future of the Second Amendment. But it is a rare thing for such advocates to be granted time with almost any senator they ask to meet—rarer still for them to be able to move even the most jaded of these lawmakers to tears by bringing out a photo of a smiling six-year-old child. Yet that keeps happening with the Sandy Hook families. Vice President Biden has remarked that it is impossible to meet with these families and not become emotional “unless you’re made of stone.” Indeed, almost every meeting they do results in senators and members of Congress weeping as they hear the stories of Newtown. But these families don’t want sympathy. They want a bill signed into law, and that was not to be—at least not yet. Mounting a furious lobbying campaign, the NRA held onto all but four Republicans and enough wayward Democrats (four) that the final 54-46 tally on April 17 fell six votes short of the threshold necessary to send the amendment on for a majority-rules, up-or-down vote. Public reaction has been swift and surprising. For the first time in the modern history of the debate, a gun safety vote has had a negative impact on the approval rating of Senators voting “no” (even in red and purple states like Alaska, Arizona and New Hampshire) and a positive impact on red-state senators voting “yes” (Louisiana and North Carolina). In that political shift, there is hope. Most of those who voted “no” surely know that they did the wrong thing by opposing the expansion of background checks in commercial settings. If they believe they erred not just morally and substantively but politically, they will change. Many are pushing them to do so, including New York Mayor Michael Bloomberg and his group Mayors Against Illegal Guns, which brings deep policy expertise and massive financial resources to the fight. Others, including Vice President Biden, Senators Manchin and Schumer, former Representative Gabby Giffords and her group Americans for Responsible Solutions, Third Way, the Center for American Progress, and the Brady Campaign are also pressing the case. Still in the arena as well are the families of Sandy Hook. Despite the glare of a spotlight that has forced them to repeatedly relive their darkest hour and subjected them to a stunning level of personal vitriol, they continue to come to Washington, meet with senators and talk to the press. They accepted early on that this was a long road—that a 20-year gridlock on gun policy was not likely to change in an instant. The motto of Sandy Hook Promise is: “Our hearts are broken; Our spirit is not.” And the extraordinary generosity of spirit that these brave people bring to this nasty, brutish political debate could, in the end, make all the difference.